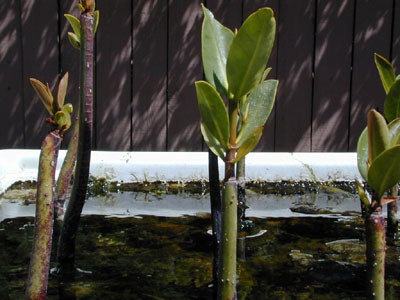 Many hobbyists have purchased one or two mangrove pods and placed them into their tank. The expectation is either the belief of some form of natural nutrient control or simply the interest in adding another aspect of livestock to their tank. My first attemp suceeded in a pod growing up to the surface and then being burned by the lighting system. 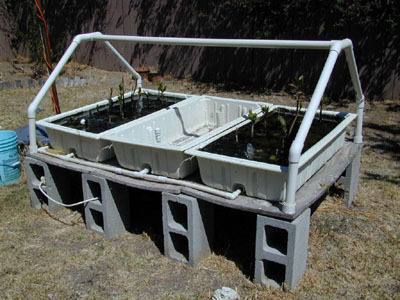 Knowing that in a contained enviroment the eventuality was that they would be limited in their growth I decided to attempt an outdoor system. 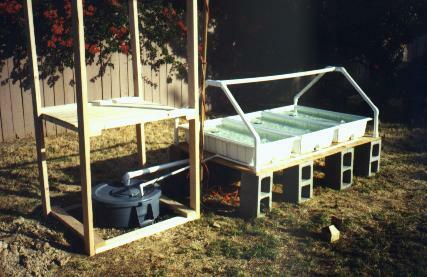 The system outdoors started with three 2'x4'x8" fiberglass molded trays. 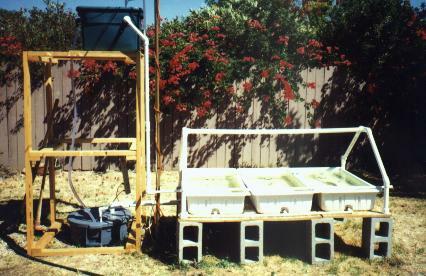 The water is pumped up to the trays by a Rio 2100, and the trays drained, collectively, into a 32 gallon resevior that was placed ( planted ) into the ground. 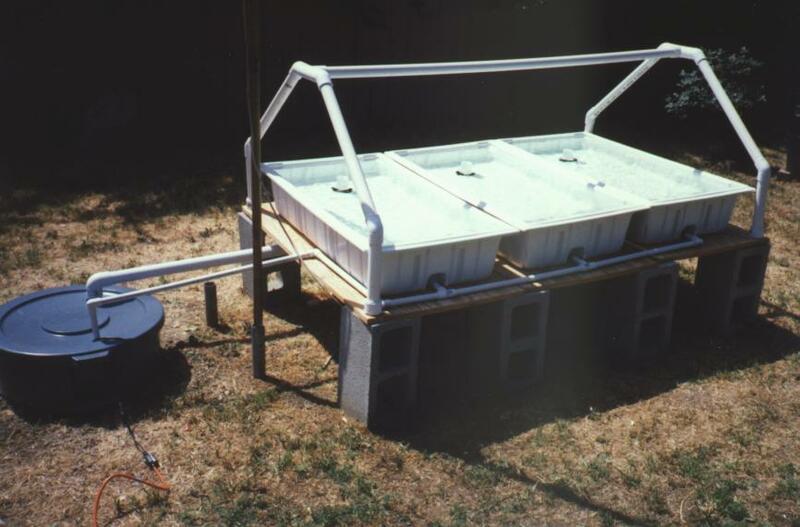 The original system was similar to an indoor version, two pumps, one returning to the tanks and the other sending water to a Surge Device ( CSM ). 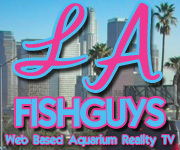 The obvious advantage, being in Los Angeles, is the sunlight and the warm climate. 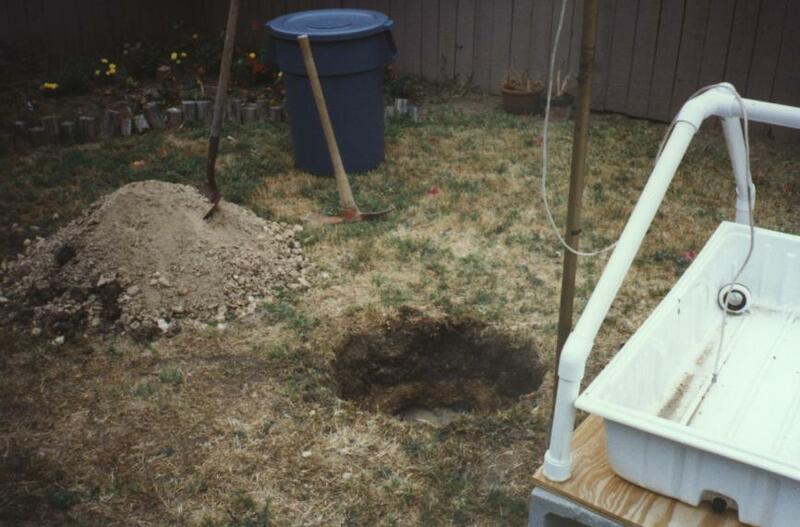 Realistically, there was a temperature concern and I considered a chiller system in the summer, but as it turned out the 32 gallon resevior in the ground gave some thermal stability. The reality is that in their natural enviroment ( ie: slow moving shallow estuaries ) quite often the water tempurature climbs into the high 80's. My greater concern became the need to create some type heating system in the winter, possibly Solar. Another phase in construction was to create the Surge System. I had collected a number of 2 X 4's and begun contructing a platform. I figured I needed to get the Surge Resevior high enough of the ground so that I could create a strong surge. Now that the Surge Tower was built, filled and running, it was time to fine-tune the system. I used a Rio 2100 to drive water up 6 feet to the Surge Resevior, but decided to change it to a Ehiem Hobby Pump, as it was stronger and filled the resevior faster. 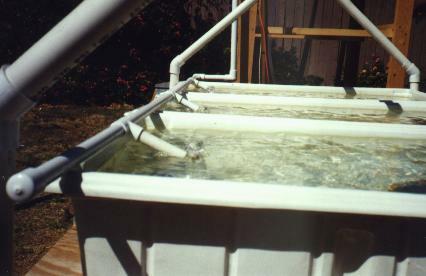 The water left the Surge Resevior via a 1" PVC pipe and was then reduced to a 1/2" manifold that distributed the water evenly into the three trays. That winter brought lots of rain to Los Angeles, you may have heard of El Nino ? Well either my carpentry skills were not up-to-par, or we had a tremendous amount of rain ( I think it was a combination of both <s> ) and the Surge Tower tumbled down. 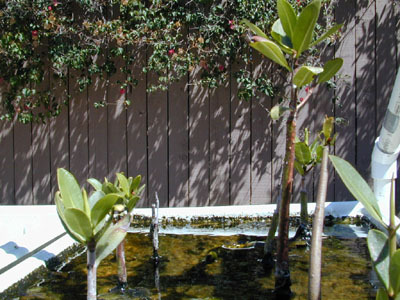 After rethinking the idea I placed two 300 watt aquarium heaters into the system and wrapped the entire system with plastic, it now took on a whole new approach....it became a Mangrove Greenhouse. Throughout the following winter the greenhouse worked out quite well. Tempuratures remained within 60 to 80 degrees, depending on the outside tempurature. I must admit that with or without the greenhouse I really never noticed any significant difference in growth rates. In fact to be honest, overall the growth rates have been rather slow. 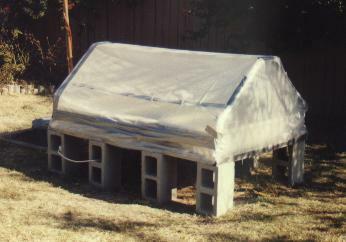 The following summer I removed the plastic covering believing that the warmer tempurature and direct sunlight would encourage greater growth. 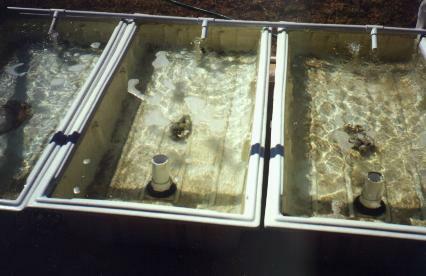 To a certain degree it has..... definately more algaes in the trays. In the fall of 1999 I was given an additional 24 pods and I planted them in the second tray. I also decided to try something, dropping the salinity from 1.022 to 1.006. Over that winter I didnt knotice much in the way of growth, but in the spring of 2000 I began to see a number of new growing tips on the new pods. By the ending of the summer ( 2000 ) I was definately seeing new growing tips and new leaves on the previous plants. It appears as though mangroves will survive in natural seawater levels but that, in my case, their growth is much slower. 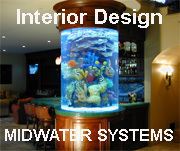 My plans for this winter are to utilize the heaters but not to wrap the tanks in plastic. I may also set up a tank indoors next to a window to see how well they do inside.